"[Sutherland's] character reflected his deeply religious nature, and his life work was the fruit of his Christian faith. ... Honest of purpose and action has adorned his judicial career and the Bench and the country." Robert Franklin Sutherland was born in New Market, Ontario to Jane Boddy and Donald Sutherland, an immigrant from Caithness who had arrived in the Toronto area in 1840. Donald, born 1815, had become the first reeve of New Market; he had also been a member of the local school board, was a Justice of the Peave, and chaired the License Commission. He had married his wife in 1847 and lived until 1880. Robert moved to Windsor as a lad of fourteen to live with his sister and brother-in-law, who at that time was the pastor at St. Andrew's Presbyterian Church, so that he could attend a higher-quality school. He went pursued undergraduate studies at Western and then read the law at the University of Toronto. 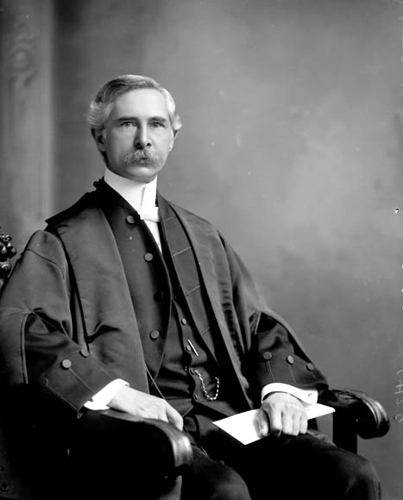 After being called to the Ontario Bar in 1886, he joined the Windsor firm of Cameron & Cleary, in which he was made a senior partner in 1905. He was appointed Queen's Council in 1898 and was active on the Windsor City Council, the Library Board, and the cricket field. Eyeing the federal political arena, he also learned to speak French. Sutherland entered federal politics at the turn of the century, representing Essex North as a Liberal Member of Parliament in the Laurier government from 1900 until 1908. He was elected Speaker of the House of Commons in 1905, but declined to run for re-election in 1908. During his years in government, Sutherland worked tirelessly on behalf of his constituents: in 1903, for example, he had the Railway Act amended to force railway companies to drain their properties - a big concern to the residents of the low-lying County of Essex - and to remove the legal defenses the railways used to avoid assuming liability for cattle killed by trains - another problem for residents in the rural parts of the county. Though his accomplishments were slight, he kept strong ties to local contacts; the Evening Record believed that "his parliamentary experience brought him many friends and few enemies." 1 In 1905, he warned the Windsor City Council in 1905 that the Detroit-Windsor ferry was renewing its license on terms that favoured the service. Duly noted, the city petitioned Ottawa to ensure that the ferry company paid a fee and lowered its rates. 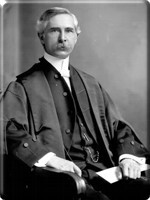 After declining to run for re-election after the 1908 term ended, Sutherland was appointed a puisne judge in the High Court division of the Supreme Court of Ontario. His career on the bench, which lasted until his death in 1922, was quiet until 1917, when he was drawn into the complex and highly volatile field of hydroelectric regulation as a member of a commission set up to determine the amount and price of power to be supplied by the Electrical Development Company of Ontario Limited to the provincial Hydro-Electric Power Commission. When the United Farmers of Ontario formed the provincial government in 1919, a confrontation between Premier Ernest Charles Drury and the Hydro chairman, Sir Adam Beck, ensued over responsibility for the extravagant escalation in expense. The Hydro Company had been planning a system of hydroelectrical radial railways to consume its surplus power. In 1920, Drury appointed Sutherland chairman of the Royal commission to examine the project's feasibility. Sutherland married Mary Bartlet, daughter of Windsor's Police Magistrate, Alexander Bartlet, in 1888. They had two daughters, Helen (1889) and Norma (1891). Helen married James Coulter, a Windsor merchant whose heirs developed the family business into what is now Ontario's largest furniture retailer, Coulter's Furniture on Windsor Avenue. Norma married Alexander Mackenzie, a physician from Bruce County nineteen years her senior, in Toronto in 1926.